India Women team is all set to play for their pride on 29th March 2018 against England Women. In Today’s Dream11 Fantasy Cricket Prediction IND-W vs ENG-W 6th T20 we will provide you all the details related to the match so that you can make the best team for dream11, myteam11 or other fantasy cricket leagues. The details will include an expert opinion on toss prediction, player recent and past performance, playing 11 for ENG W and IND W, pitch report, weather conditions, key players who are likely to perform, past record of both the teams and who will win according to astrology. All teams and information are for FREE but you make sure to read all the details as these pieces of information are key to success in dream11 or any fantasy cricket leagues. Who Will Win the 6th T20 Between IND-W v ENG-W on 29th March? Date: 29th March 2018 (Thursday). 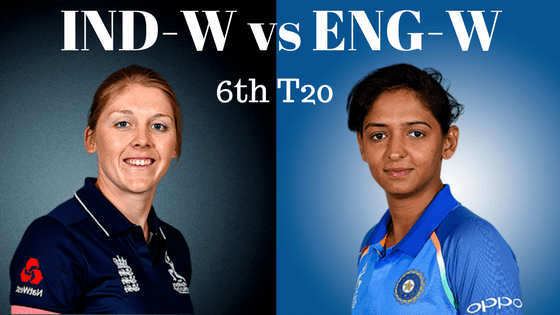 Match: Women’s T20I Tri-Series in India, 2018, IN-W vs EN-W 6th Match. Average second inning score is 153. Highest total on this ground was 199/3 in 18.4 overs by ENG-W v IND-W. The pitch is expected to be batting friendly. The batsmen will enjoy batting in this pitch as the bowl will come nicely into the bat. Seamers may get some help in the first inning. The pitch will support all the department a bit. Australian Women bowlers have utilized the pitch in the first inning and bowled out ENGW in 17.4 overs in 5th T20. England girls have won all the five matches played recently against Indian girls. Since 2012 Indian Women’s team haven’t won any game against England Women team. It will be interesting to see how Harmanpreet Kaur takes this challenge as they have lost all the matches in this series. It will be a sunny day in Brabourne Stadium, the humidity will be almost 80% and the temperature is expected to be 28-degree Celsius. The weather will be clear and there is no sign of rain on the match day. Mithali Raj, Smriti Mandhana, Pooja Vastrakar, Veda Krishnamurthy, Deepti Sharma, Mona Meshram, Harmanpreet Kaur, Jhulan Goswami, Jemimah Rodrigues, Taniya Bhatia, Poonam Yadav, Shikha Pandey, Radha Yadav, Anuja Patil, Rumeli Dhar. Natalie Sciver, Bryony Smith, Danielle Wyatt, Heather Knight, Anya Shrubsole, Amy Ellen Jones, Tash Farrant, Alice Davidson Richards, Tammy Beaumont, Sophie Ecclestone, Katie George, Jenny Gunn, Alex Hartley, Fran Wilson, Danielle Hazell, Kate Cross. This team is a dream team of the previous match played between India Women and England women. This team won the grand league. You can take reference from this team. The demo team for IN-W vs EN-W is below in this post. There is not much for India to gain or lose in the sixth T20 which is to be played on 29th March 2018. Their main focus would be more on preparing for the upcoming T20 World Cup. Many Indian players underperformed in this series. Shikha Pandey may play in place of Radha Yadav. Mithali Raj, S Mandhana, Pooja Vastrakar, Harmanpreet Kaur(c), J Rodrigues, Anuja Patil, Poonam Yadav, Deepti Sharma, Shikha Pandey, Taniya Bhatia (wk), Jhulan Goswami. This is a golden opportunity for Heather Knight to do experiments as this is almost a practice match for them before the finals. Anya Shrubsole was seen practicing in nets but she is not completely fit so she will not feature in today’s match. Impact players may make a way for the players who haven’t played in this series. Tammy Beaumont, Heather Knight (c), Danielle Wyatt, Jenny Gunn, Natalie Sciver, Tash Farrant, Alice Davidson Richards, Amy Ellen Jones (wk), Sophie Ecclestone, Alex Hartley, Danielle Hazell. Note: England Women team may experiment a lot so try to keep more Indian players in your team. Tammy Beaumont: Beaumont has scored 198 runs in last five matches including practice match. Most Important point to notice is that she has been consistent throughout the series. In the last inning, she scored 17 runs and contributed 12 points. 82.51% of the dream11 users have selected her in their fantasy teams. Pro Tips: Beaumont is only an option for a wicket-keeper. For the grand league, you can keep other players from the playing 11 and this will help if Tammy is rested. Mithali Raj: Except 3rd T20 she didn’t perform well. She failed to contribute with the bat in previous game.53.36% of the users have selected her in their team. Smriti Mandhana: Mandhana contributed with the bat in first two games but she couldn’t contribute in the last match. She scored only 3 runs and contributed 7.5 fantasy points in dream11. 86.26% of the users have taken her in their dream team. In last 10 matches, she scored 308 runs with an average of 34.22. Danielle Wyatt: If not rested she would be the perfect choice for a Captain. In last 10 games, she scored 348 runs with an average of 38.66. She scored 6 runs in the last inning and contributed 5.5 points. 87.09% of the users have selected her. Heather Knight: If you rank a player for underperformance, she would top on that list but she is a player who can make you win a grand league. She Couldn’t contribute with the bat in the fifth game. 28.14% of the users thought to take her on their team. Jemimah Rodrigues: A rising player for Indian Women’s team. She scored 50 runs in the last inning and contributed 47 points. 75.68% of the users have selected her. Pro-Tips: Try to keep more of Indian players as England Women’s may rest some of their important players. But if you are playing with multiple players you can take England batsmen in your team. Natalie Sciver: One of the most valuable player to rely on as she contributes with both bat and ball. In the last inning, she scored 10 runs and took 1 wicket and contributed 22 points. 80.78% of the users have chosen her in their dream team. Harmanpreet Kaur: She has scored 76 runs in last 3 matches in this Women’s Tri-Series. She has scored 33 runs in the last game and contributed 20.5 points. 61.4% of the dream11 lovers have taken her in their dream team. Jenny Gunn: In last 10 matches Gunn took 13 wickets. She scored 12 runs in the last inning played against Australian girls and contributed 12 points. She was selected by 49.72% of the users. Anju Patil: She couldn’t contribute with the ball but she contributed with the bat in almost every game. She scored 38 runs in the last inning and contributed 24 points. 45.71% of the users have selected her in their team. Pro-Tips: Try to make a combination of the above players. We will provide you a demo team later in this post. Jhulan Goswami: In last 5 matches Goswami took 7 wickets. She took 1 wicket in the last inning and contributed 12 points. 71.26% of the fantasy players have chosen her. Pooja Vastrakar: A very economical player to have on your team. She scored 41 runs and took 2 wickets in last two matches. In the last game, she scored 19 runs and took 2 wickets and contributed 31 points. 73.54% of the users have selected her. Tash Farrant: She scored 3 runs and took 4 wickets in this whole series. She contributed 6.5 points in the last match. 57.15% of the users have taken her. Danielle Hazell: she couldn’t contribute in the last game but she is a good option to have on your team. 20.75% of the users have chosen her. Poonam Yadav: In Last 9 matches she took 8 wickets. In the last game, she took 1 wicket and contributed 12 points. 35.73% of the users have selected her. Pro-Tips: Try to keep Goswami, Vastrakar, and Farrant in your team. For multiple teams make a combination from the above list. Pro-Tips: Make a combination of the above players for the best result. In this Women’s Tri-Series India failed to register a single win. On paper and previous records, ENGW has an upper hand. Our Astrology team says England Women will win the match. EN-W may think of batting first after winning the toss as they may want to get prepared for every situation for the finals but our astrology team suggests that Indian girls captain Harmanpreet Kaur will win the toss and she will bowl first. Note: If you want to win in every match then play in small leagues. Conclusion: Many of our users want 100% winning teams but guys cricket is a game of uncertainty. We provide you all the details of every match, if you play smart you will definitely win. Make sure you don’t leave any important data. This is it for Today’s Dream11 Cricket Prediction IND-W vs ENG-W 6th T20. GOODBYE!